A New Jersey elementary school science class has a new pet after a lizard was discovered in a student's salad. The lizard had been refrigerated for days. 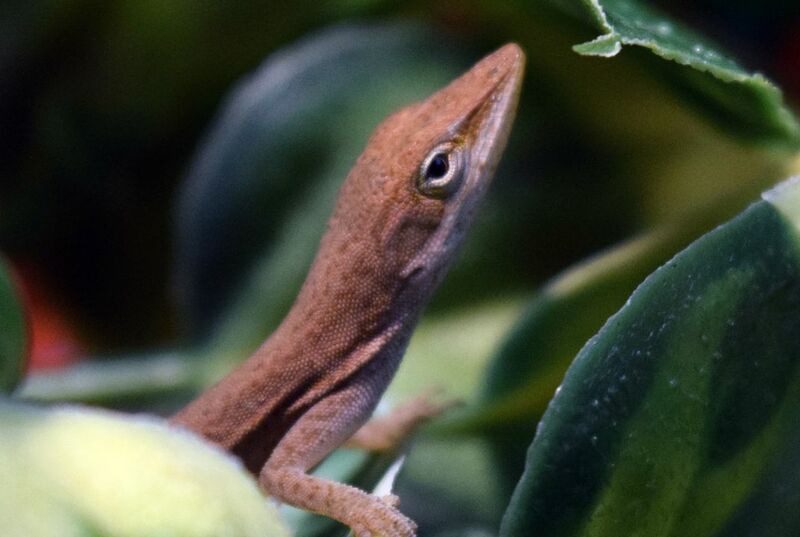 Riverside Elementary School science teacher Mark Eastburn told NJ.com the 3-inch green anole lizard was found by a kindergartner. It was in a bundle of tatsoi greens. 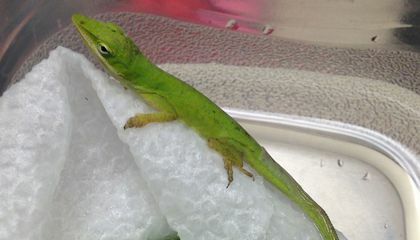 The lizard had been cold and lifeless after being confined in a refrigerator for days but it has been warmed and now lives in a cage in Eastburn's class. "It's a really fitting mascot for our science lab," he said. The lizard, dubbed "Green Fruit Loop," came from Florida. Eastburn said green anole lizards live in the southeastern states, from Texas to North Carolina. "It probably has some moderate adaptation to the cold, which is why it made it through," Eastburn said. The tatsoi had been bought from Whole Earth Center, a natural foods store in Princeton. Mike Atkinson, the store's produce manager, said the greens are cleaned as they're stocked. He said the lizard must've been tucked away in a leaf. "I've been in produce for 17 years and I've never heard of a lizard making it to the customer," Atkinson said. He said he doesn't think the lizard would have made it in a conventional, non-organic box. "It might normally surprise or freak out conventional shoppers. But the majority of organic shoppers realize that produce is grown on a farm and there's lots of bugs and animals that live on a farm too," Atkinson said. Why was the lizard a good fit as a class pet? the lizard was a good fit for a class pet because they are a great representation of science because the lizard was life less for days while being refrigerated, but when the creature was warmed up it was alive again. "It's a really fitting mascot for our science lab," this is why the lizard was a good representation. I chose this article because i found it off putting that a lizard was found in a students salad. What are the odds of finding a lizard in your lunch?!! I believe that the lizard was a good fit as class pet because it is a science class and you could probably learn a lot from a lizard like how it adapted to the cold. I found the article surprising because how does a lizard get into a salad that is made in a factory. I think that the company owes an apology to the kid and school. The lizard was a good fit as a class pet because it shows compassion and it doesn't bite and it said that it was safe to hold and touch.I chose this article because i'm thinking about getting a lizard and i want to make sure that they are safe and they are. It was a good fit because it is a science class and you learn about different animals in that class. That lizard can be used as an example for classes so it can be more fun for the classes. I think the lizard would fit well as a class pet, because it can be an interesting pet for the students to see. Also, like some people said, "It can make a good mascot". I think the lizard is a good fit as a pet because it give the class something new to talk about. and they also can learn about the lizard. The lizard was a good fit as a class pet because it's life and it lives in the science room where you learn about life. I believe the author's purpose was to inform us about when food stores process and clean their crops they receive, if they don't do it carefully, you could potentially end up with anything in your purchase of that good.